King Nabopolassar of Babylon in 612 BC leads his troops out of the Ishtar Gate to join King Cyaxeres of Media in an attack against the Assyrians. They pursued the Assyrians who fled the battle field seeking the protection of the walls of Nineveh. King Nabopolassar led the charge. Their armies laid seige to Nineveh, pounding its gates and scaling its walls. King Nabopolassar was right in front of the Gates of Nineveh leading the assault. 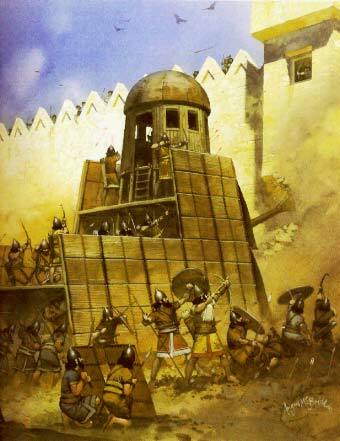 The Assyrians had impaled the bodies of several of the Babylonian and Median slain soldiers in front of their walls hoping to instill fear but it only caused them to fight harder. They finally breached the city walls. As they poured through the walls, one of the Babylonian generals led his calvary around the rear of the city and routed the fleeing Assyrians. 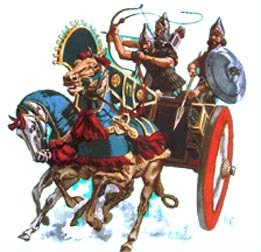 A heavy war chariot pursues the fleeing Assyrians.